How did an addicted ex–con on the verge of suicide become a caring member of the community? With a little help from a Shih Tzu named Bruno. James “Head” Guiliani, a confidante of the Gotti regime, was arrested and jailed on a weapons charge. After his release, he fell back into alcohol and drug addiction—until, one day, he came across an abandoned, abused Shih Tzu in the street. He rescued the dog, whom he lovingly named Bruno, and, in the process, turned his own life around. 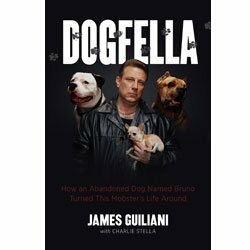 Dogfella recounts the story of Guiliani’s life, from his involvement in street gangs and the infamous Gotti crime family to his incarceration and eventual redemption through animal welfare. Guiliani’s new career has led him to save pit bulls from a dog-fighting ring and drive through six-foot snowdrifts to reach 200 cats stranded at a Long Island sanctuary. Dogfella book will be autographed by James.You can request who you would like the book signed to in the comments section at checkout! The man who walked on water said that everyone would require a second chance in life, and that is the crux of Dogfella. James Guiliani offers his autobiography which details a dramatic and exciting recounting of doing a three-sixty in his walk. An epiphany spurred on by a shi tzu named Bruno will touch the heart of people and animal lovers both. James went from the streets to the rescue, and many animals are alive and better off because of it. This story seems like a classic movie Cagney may have starred in, but it is the story of Guiiliani's life. During the read, I couldn't help but think that this would also make an awesome film. I enjoyed the book and became an instant fan of one of the best advocates for animal rescue! I enjoyed Dogfella.I appreciated the candor of James and how he speaks his mind. You can tell he is all for the animals and has a passion for what he does. The story was very interesting from his life as a mob enforcer to the details of animal rescues. This is my candor review with no fancy writing! I enjoyed the book and became an instant fan of one of the best advocates for animal rescue! DOGFELLA - A MUST READ FOR ALL ANIMAL LOVERS!! This book is truly inspiring and heartfelt. It gives such an honest account of James Guiliani's life and how his life was changed by a little Shih Tzu named Bruno. This book will have you laughing and crying and leave you thankful for people like James who dedicate their lives by saving animals. A MUST READ!! !